Mahal na Araw, Semana Santa or Holy Week is one of the most important seasons for Roman Catholics here in the Philippines. It is one very sacred tradition in the Filipino culture for this is the time where the life of Jesus on earth is observed and remembered. Activities during this season include re-enactment, reliving the life and engaging in the passion of Jesus Christ. 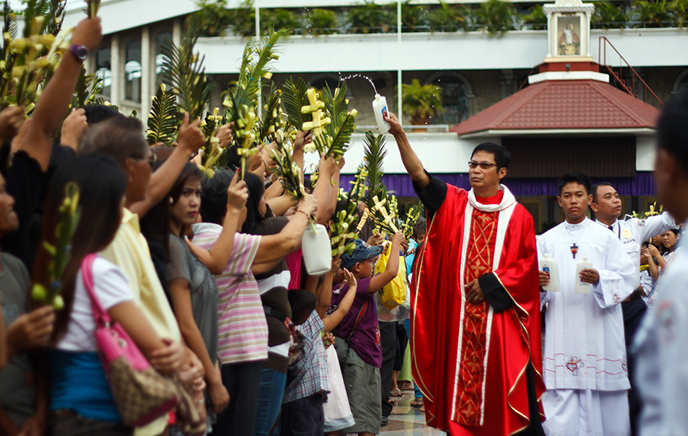 Palm Sunday signals the start of the Holy Week, wherein churchgoers raise their palaspas or palm leaves into the air as the priest bless it with holy water. After the mass, people bring their palaspas home and pin or tack it on their doors or windows or placed it on the altar. It is believed that blessed palm leaves take away negativity and bring good things to one’s home. It is a tradition for Filipinos to keep the palaspas pinned on the door or window for a year. During Holy Week, Catholics do their best to abstain from certain vices such as smoking, drinking alcohol. They also do some fasting and avoid eating their favorite meals like pizzas, hamburgers or anything with meat, especially on Fridays. 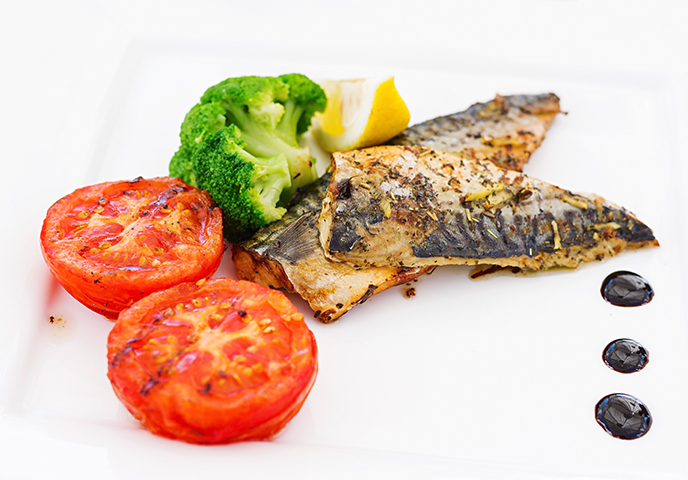 As much as possible, meals should only include fish, fruits and vegetables. 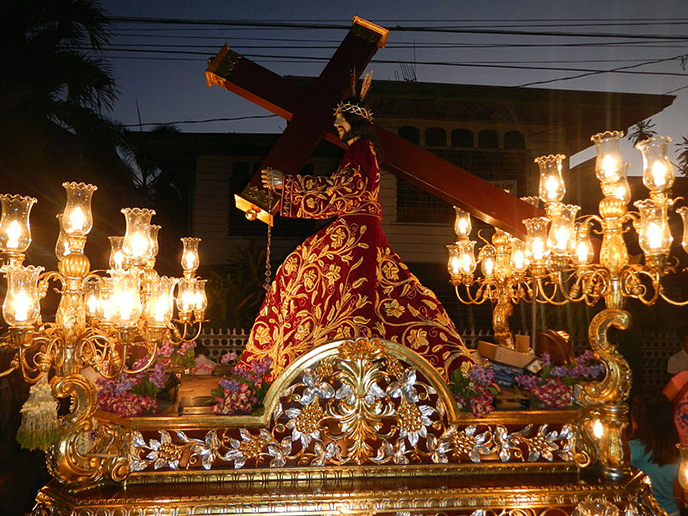 Pabasa is another Catholic devotion during Holy Week. It involves reading of religious texts, particularly about the life of Jesus Christ. It starts right after the mass on Palm Sunday. It is also observed during Holy Monday until the early morning of Maundy Thursday. It ends around noon time on Good Friday. The pabasa may be sung or can be accompanied by a number of musical instruments. Some younger generation would join the pabasa and they would make a modern version of music accompanying the reading of religious texts. Pabasa is widely practiced in different places in Luzon and Visayas. 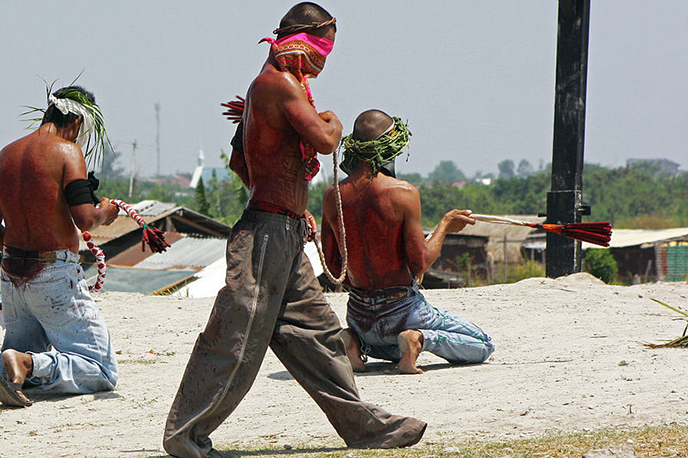 Self-flagellations and crucifixions are some of the popular forms of Penitensya or rituals that Catholics participate in during Holy Week. 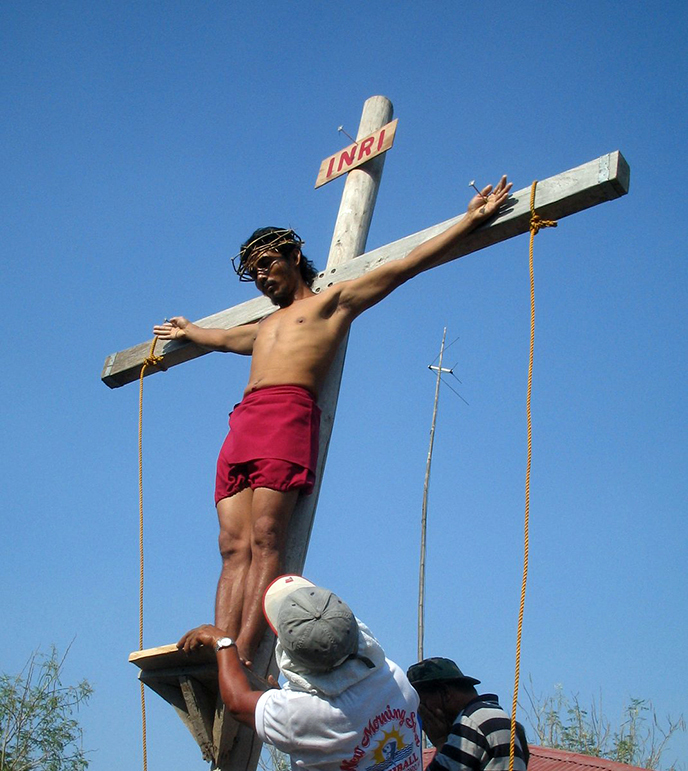 This tradition involves re-enactment of Jesus’ suffering by having themselves nailed on the cross. 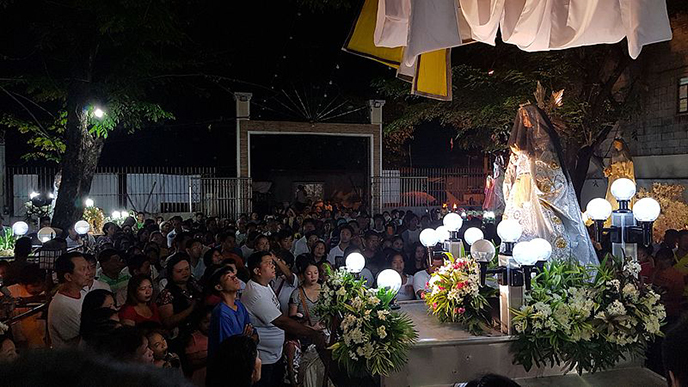 In Pampanga, penitensya starts on Maundy Thursday where penitents have their faces covered and they would continually lash on the self-inflicted wounds on their backs with a set of bamboo sticks held together and attached to a rope. Meanwhile, Crucifixion happens on Good Friday. Thousands of foreign and local tourists come to Pampanga to witness this long-time Filipino tradition. This is a yearly Holy Week tradition for most Filipinos. Visita Iglesia usually happens on Maundy Thursday and Good Friday in which one, preferably together with his or her family, visits at least seven different churches. 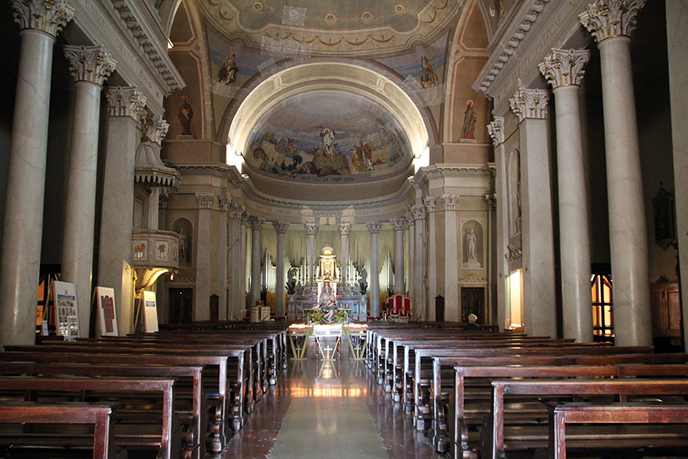 This tradition originated from a 16th-century Roman Tradition led by St. Philip Neri. The purpose of Visita Iglesia is to pay tribute to the Blessed Sacrament and seek penance for one’s sins. It is believed that if one is able to visit 7 different churches, his/her wish will be granted. In addition, Stations of the Cross is observed during church visits. Some churchgoers would pray on two stations for each church or visit 14 churches to complete the 14 stations. Santo Entierro Procession happens during Good Friday where antique and life-size sculpted images of saints are lined up for the long procession. These images are usually carried by a carozza, abundantly decorated with flowers. The sculptures of the saints are usually dressed in bejeweled and decorated velvet. This is the highlight of the Holy Week since a large congregation gather around the church vicinity for the late afternoon holy procession. Only the old, disabled and sick Catholics are “excused” from participating in the said procession. Salubong is a practice on Easter Sunday that happens at 4 a.m. It is vigil re-enacting the meeting of Mary and Jesus Christ after His resurrection. This also serves as a welcoming rite for the Son of God. The ritual usually begins with two separate processions from the opposite ends of a community, with Jesus at one end and Mary on the other. The two processions will then meet at midpoint wherein an angel (represented by a young girl) lifts the black veil, which symbolizes sadness, from the face of Mary. It signifies the end of her mourning as Jesus Christ is alive again. Families then celebrate the Resurrection of Jesus by preparing feasts, eating food that they have abstained from during the Holy Week. Roman Catholics in the Philippines religiously observe the Holy Week as a form of penance, devotion and prayer to God and His Son. It is one tradition etched and kept in the heart Filipino Catholics.